As Director of the Ketamine Research Institute, and speaking from the perspective of almost 20 years of academic and clinical practice with ketamine therapy, I would like to tell you why my colleagues and I think that this program is the finest learning opportunity for physicians to acquire the knowledge and skill necessary for this new and exciting therapy. Ketamine Infusion Therapy for Physicians is the only coordinated and comprehensive training program in the use of ketamine therapy for physicians in North America. The program meets or exceeds the American Psychiatric Association consensus recommendation for ketamine therapy and the American Society of Anesthesiology guidelines for monitoring and airway management requirements, based on the Yale-National Institute of Mental Health protocol. The Ketamine Infusion Therapy for Physicians program is comprehensive in that its teaching content is not restricted to theory or academic interest but grounded in almost 20 years of active clinical ketamine infusion practice. All major aspects of ketamine therapy that have practical clinical value are represented in the program. The teaching approach stresses contemporary medicine and bioscience, yet addresses the full translational medicine and transpersonal aspects of ketamine therapy as derived from clinical and basic science research. Over the years, I have had the privilege and pleasure to constantly revise and refine this program after presenting it in many venues including academic centers, hospitals, and government organizations to physicians, residents, and fellows. We are dedicated to ensuring that every student completing the course is competent in this new discipline and ready to incorporate it into practice. There is no other course in the country that invests as much attention and energy in each student. We are satisfied that we have created the gold standard in physician ketamine infusion therapy training. The Intensive Course presents all the material necessary for physicians to safety and effectively provide ketamine infusion therapy to their patients in their practice environment. It is held over an intensive two-day period and covers all principles and practices necessary to begin ketamine infusion therapy. It also expands the learning experience by providing detailed information and templates pertaining office and regulatory documentation, monitoring and optimization protocols. The course in limited to 6 physicians to provide for a small group learning environment and hands-on experience. Also, segments of the course training are conducted “on site” in an actual infusion center so that you will have an opportunity to become familiar with the environment in which infusions are performed. This includes demonstration of the necessary monitoring equipment, intravenous delivery systems, and supplies necessary for the safe administration, storage and handling of ketamine. We also review various options related to 2R,6R HNK pharmacokinetics to optimized the treatment efficacy and duration of benefit of the standard ketamine infusion. Physicians who complete the Intensive Course are also provided with mentoring to during the initial phases of integrating ketamine infusion therapy into their practices. The course meets and exceeds consensus recommendations published by the American Psychiatric Association and the American Society of Anesthesiologists. Physician who complete this course are well versed in all the matters related to ketamine administration including, practice integration, indications/contraindications, and medico-legal issues. Physician who complete the course are provided with certification by the Ketamine Research Institute. Offered three times per year in a small group/seminar setting. The intensive course not only covers all of the practical aspects ketamine therapy, but expands into scientific principles allowing optimization of the basic protocol. Segments of the course training are conducted “on site” in an actual infusion center so that you will have an opportunity to become familiar with the environment in which infusions are performed. This includes demonstration of the necessary monitoring equipment, intravenous delivery systems, and supplies necessary for the safe administration, storage and handling of ketamine. Our next course is scheduled for May 18th-19th 2019. Please contact us for future course dates. We also provide special "one on one" private tutorials for physician by arrangement. The course content is comprehensive and integrated. It systematically embraces all major aspects of ketamine therapy and emphasizes the incorporation of ketamine therapy into contemporary professional practice. Spravato - Is it an alternative to the Ketamine infusion? "I am an Austrian psychiatrist. One year ago, I started using ketamine for the treatment of my depressive patients without formal training using the standard protocol published in the literature. I decided to attend the Ketamine Institute’s training program to enhance my skills. 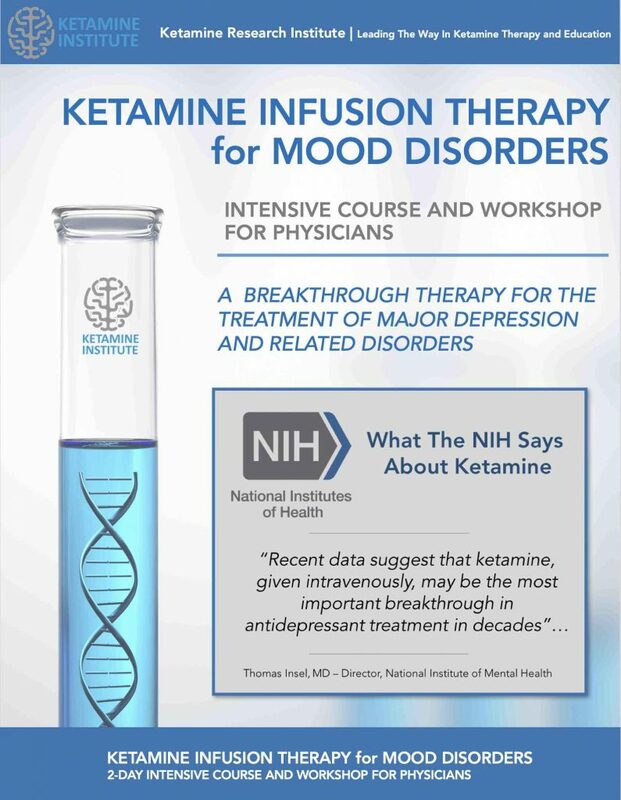 The Ketamine infusion therapy for mood disorders” training course for physicians went above and beyond my expectations. Dr. Grass' brilliance and profound professional expertise made this course an unforgettable and truly eye-opening experience. I can now understand Ketamine from a pharmacological, anesthesiology, psychiatric, medico-legal and therapeutic perspective. I could put the contents I learned immediately into practice and my patients are already profiting from the knowledge I gained." "I arrived safely to Salzburg yesterday. Today we are performing our first optimized ketamine infusion. My patients and I are excited about this. The sheer fact that I have the option to apply the optimized protocol gives my clients strength. It’s a whole new experience for them when I tell them “you don’t have to suffer longer than you want to.” I make them aware that we can “eradicate” 80% of depressions in a week. It gives them confidence and a reason to hope. I went to Florida to learn how to give infusions properly, I came back with a huge arsenal of psychiatric-psychotherapeutic power-tools. The Ketamine Institute is leading the way in the field of ketamine infusion therapy and physician education with our new ketamine infusion training program. We’re on a mission to accelerate the health care revolution. We have pioneered ketamine infusion therapy to bring the latest breakthrough discoveries about ketamine out of the research lab and into our infusion centers.